In the case of the MACD indicator, the most widely used entry signal is when the MACD line crosses over the Signal Line in the direction of the Daily trend. This will get you into the trade after the initial move has begun. However, since the move has begun and continued, a trader can look at that as additional confirmation that the move is more likely to continue its follow through in that direction. 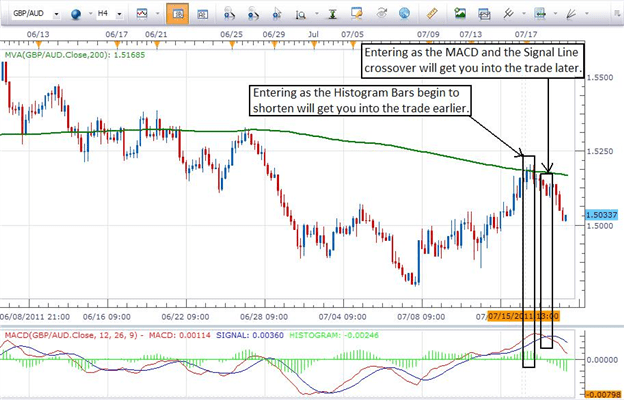 A less widely used entry signal generated by the MACD indicator is to make use of the histogram bars. As seen on the 4 hour chart of the GBPAUD below, as soon as price action begins to move to the downside, the green histogram bars will begin to shorten. As soon as a bar does not close above the previous bar, that means that upside movement by price has subsided. An aggressive trader can use that as a signal to short the pair at that point. Note how a trader entering based on the histogram bars would have entered the trade approximately 80 pips ahead of a trader who entered based on a MACD/Signal Line crossover. Keep in mind however, as stated in the linked article above, entering a trade sooner means entering with less confirmation and that is not always a good thing. Each of the above entries based on MACD is a valid entry. As usual, it is up to each individual trader to decide which one is right for them. Richard Krivo contributes to the Instructor Trading Tips articles.